Years after almost taking part in Purge night himself, Leo Barnes (Frank Grillo) has become the head of security for Senator Charlie Roan (Elizabeth Mitchell) a Presidential candidate whose vow to end Purge night makes her a huge target. The Purge: Election Year is grounded by solid performances from its central leads. Grillo and Mitchell have good chemistry and you can feel that their characters have had a solid relationship. The secondary characters who each try to survive Purge night but also end up helping Leo and Charlie along the way are pretty one-note but likeable enough. Laney Rucker (Betty Gabriel) is one of the more interesting characters as she’s a volunteer paramedic who offers her services while the regular paramedics don’t venture out on Purge night. When it comes to the fight scenes they are often chaotic and hard to follow, you could say this is a stylistic choice or it could just be bad filmmaking. The film tends to get away with it whenever there’s a gun battle or a chase scene but when it’s a one-on-one fight that’s when things become confusing. 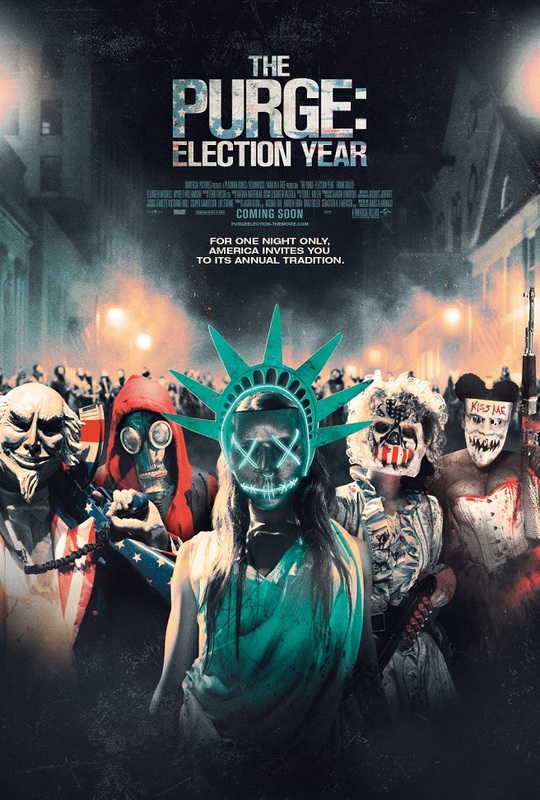 The Purge: Election Year tries to say a lot about socio-political themes that are very relevant to today while still having a lot of gore and violence. It doesn’t always work and it’s pretty heavy-handed at times but it is interesting. The Purge: Election Year keeps the tension and surprises but it does feel very similar to but not as good as its predecessor, The Purge: Anarchy. 3/5.